A flower is a part of a plant. Flowers are also called the bloom or blossom of a plant. The flower grows on a stalk – a thin node – which supports it. Flowers have petals. Inside the part of the flower that has petals are the parts which produce seeds. In many plants, a flower is its most colourful part. We say the plant 'flowers', 'is flowering' or 'is in flower' when this colourful part begins to grow bigger and open out. There are many different kinds of flowers in different areas in the world. Even in the coldest places, for example the Arctic, flowers can grow during a few months. Flowers may grow separately on the plant, or they may grow together in an inflorescence. In botany, flowers are the key evolutionary advance made by flowering plants. 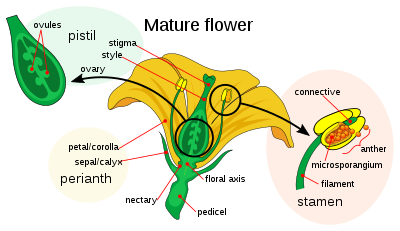 To investigate the structure of a flower, it must be dissected, examined under a binocular microscope, and its structure summarised by a floral diagram or a floral formula. Then its family can be identified with the aid of a flora, which is a book designed to help you identify plants. Flowers contain the reproductive organs of a plant. Some flowers are dependent upon the wind to move pollen between flowers of the same species. Many others rely on insects or birds to move pollen. The role of flowers is to produce seeds or fruit (fruits contain seeds). Fruits and seeds are a means of dispersal. Plants do not move, but wind, animals and birds spread the plants across the landscape. [[Image:syncarp evolution.svg|thumb|The evolution of syncarps. The two clades diverging some 300 million years ago. Since the ovules are protected by carpels and integuments, it takes something special for fertilisation to happen. The megagametophyte has just seven cells; of these, one fuses with a cell, forming the nucleus of the egg itself, and another other joins with the other , and dedicates itself to forming a nutrient-rich endo. The other cells take auxiliary roles. Flowers and flowering plants first appeared about 130 million years ago in the Lower Cretaceous. Flowers have long been admired and used by humans. Most people think that flowers are beautiful. Many people also love flowers for their fragrances (scents). People enjoy seeing flowers growing in gardens. People also enjoy growing flowers in their backyards, outside their homes. People often wear flowers on their clothes or give flowers as a gift during special occasions, holidays, or rituals, such as the birth of a new baby (or a Christening), at weddings (marriages), at funerals (when a person dies). People often buy flowers from businesses called florists. People also eat some types of flowers. Flower vegetables include broccoli, cauliflower and artichoke. The most expensive spice, saffron, comes from the crocus flower. Other flower spices are cloves and capers. Hops flowers are used to flavor beer. Dandelion flowers are often made into wine. Honey is flower nectar that has been collected and processed by bees. Honey is often named for the type of flower that the bees are using (for example, clover honey). Some people put flowers from nasturtiums, chrysanthemums, or carnations in their food. Flowers can also be made into tea. Dried flowers such as chrysanthemum, rose, jasmine are used to make tea. Flowers were used to signal meanings in the time when social meetings between men and women was difficult. Lilies make people think of life. Red roses make people think of love, beauty, and passion. In Britain, Australia and Canada, poppies are worn on Memorial Day as a mark of respect for those who served and died in wars. Daisies make people think of children and innocence. ↑ Nam, J.; Depamphilis, CW; Ma, H; Nei, M (2003). "Antiquity and evolution of the MADS-Box gene family controlling flower development in plants". Mol. Biol. Evol. 20 (9): 1435–1447. doi:10.1093/molbev/msg152 . PMID 12777513 . http://mbe.oxfordjournals.org/cgi/content/full/20/9/1435. ↑ tiny haploid female plant which includes the egg. ↑ Crepet W.L. (2000). Proceedings of the National Academy of Sciences 97 (24): 12939–41. doi:10.1073/pnas.97.24.12939 . PMC 34068 . http://www.pnas.org/cgi/reprint/97/24/12939. ↑ Wilson Nichols Stewart & Gar W. Rothwell ‏ 1993Paleobotany and the evolution of plants. 2nd ed, Cambridge Univ. Press. This page was last changed on 10 December 2014, at 17:49.